I come from a family of hand shakers. My mother was given the official title of “hand-shaking Christensen” owing to her stance of giving kisses sparingly, especially to strangers. Coming from a European background, you may better understand my dilemma when I moved to the South Pacific. Growing up, my grandparents on occasion kissed my forehead, but not much more, except one grandpa who used to kiss me directly on the lips. 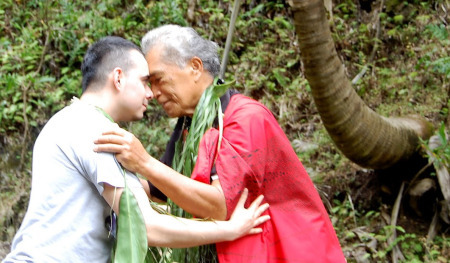 Otherwise, when I was introduced to someone, I was taught to shake their hands and say “how do you do”, or “happy to meet you.” After I was married, I was adopted into a Polynesian society where kissing was given freely to all. If you did not kiss your friends and relatives, you were considered (ho’okano) or rude. In fact, if you did not kiss – you would most likely get embarrassed in front of your peers. In ancient Hawaii, the honi was the usual greeting in which two people greet by pressing noses at the bridge and inhaling at the same time. It is considered very honorable, and it represented the exchange of mana (spiritual power between two people) and ha (the breath of life). This honi seems very unusual to foreigners who witness it. 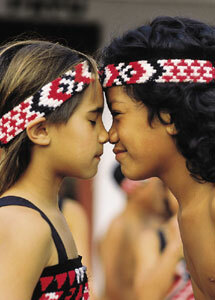 Maori people from New Zealand call their kiss the hongi. 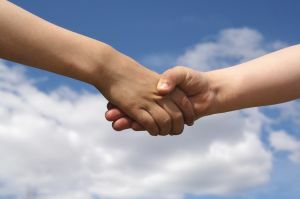 When the Hawaiians saw that the white man only shook hands as a greeting, they started to call them ha ‘ole, which literally means without breath. They thought it was cold and distant. Having been raised as an American, we are used to having our “personal space”. There is really nothing like that in Polynesia, since they are used to greeting with a hug and kiss, sleeping in the same room, and sharing everything, they cannot understand our need for “space”. One father in Hawaii dropped his daughter off at school, and as she opened the door, several things fell out of the unkempt truck. She picked them up hurriedly, returned them inside and slammed the door. The father asked for a kiss good-bye. She gave what is called “stink eye” (disapproving look) and sped on to her friends. So the father left his truck on idle tooted the horn several times until she turned around and then he waved at her to her chagrin. Another 13-year-old girl forgot a book in the car when let off for school. She turned back to get the book, but refused her Hawaiian father a kiss when asked. So the father would not give her the book. Several times he would hit the gas pedal and the car went forward a bit. The daughter, needing the book, would follow to catch up, but he would not give the book to her until he got his kiss goodbye. Some other countries, like France, kiss on both sides of the cheeks when greeting one another. Hence, French Tahitians do the same. So you need to be ever adept at determining who you are meeting to know whether you should shake hands, kiss with your nose, or kiss on both sides of their face. Some countries even do it twice on each cheek! It can be rather confusing and embarrassing. Some say, just take the kiss and run with it! It has taken me over twenty years to get used to Polynesian kissing and hugging, and now I am moving back to the cold distant mainland America. Would you be comfortable doing the honi or hongi? Share with us the way you are used to greeting people in your country. Do you need personal space or are you a kiss/hug type of person? Interesting and fun to read. America has so many customs because it has so many people. I would safely say not many kiss strangers, in that case a handshake is proper and accepted. Now for people you know, at least for me and mine, there is hugging and kissing! We hug and kiss hello, we hug and kiss good bye. It is not a matter of personal space but one of affection. Well, that's the first time I ever learned where the word haole came from. I'm on the mainland now and I sure do miss getting and giving hugs and kisses. Everything seems so stiff-upper-lip and proper after being away so long. I can hardly wait to get back to normalcy -- on the islands. I love kissing...any style, any way, any culture! Can't wait to find out how the extraterrestrials kiss! Glad you stopped over and enjoyed your read. Aloha! So true diogenes - I am so fortunate, once I got used to it. Sorry, I don't know your Polynesian Pidgin word - something about gettin' it? one git it and you all git it - enlighten me, please. Hi there: I know some Polynesian Pidgin, "Wungitflualgitit." I'm British. We have to consider all we do: kiss or not; how hard to shake hands...never shake hands with a vahine unless she offer first! Must be wonderful to have a life filled with love and kisses.